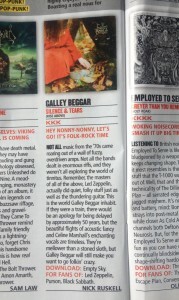 OK, so they may have mixed up our personnel slightly, but we were pretty chuffed with this revie w in Kerrang! courtesy of Nick Ruskell. We’ve also had some lovely words written about us in Prog Magazine, who described Silence & Tears as “superb” and “highly recommended”. To read the full review, click here . Like with anything a person puts their heart and soul into, there is always a brief period of holding your breath in anticipation, hoping it’s well received … So the lovely reviews we’ve received of late have been fantastic.